Dandeli which is situated in northern part of karnataka is one the best adventure destinations in south india. Located on the banks of river kali, middle of western ghats, Dandeli provides picturesque views of western ghats. Most of the people may not be aware of this place and for those who are interested in spending weekend adventurous, read the post below. Dandeli is famous for Jungle lodges and there are many options for staying. We can book accommodation in dandeli though http://junglelodges.com/ or by contacting the resort directly. Among all the resorts in Dandeli, Old Magazine house, Bison resort, Kali Adventure camp and Stanley farm house are famous and provide comfortable stay. If you are a group of people and looking for budget accommodation then book Old magazine house or Stanley Farm house. Old Magazine house has dormitory which can accommodate at least 20 people at affordable price. Along with dormitory, Old magazine House has cottages which can acommodate 4 people per cottage. Stanley farm house and Kali adventure camp offers camping in tents. If you are looking for premium cottages, then book Bison resort, which offers comfortable stay along with many river activities. Kayaking in Kali river will be a memorable experience and you will feel relaxed while doing kayaking. 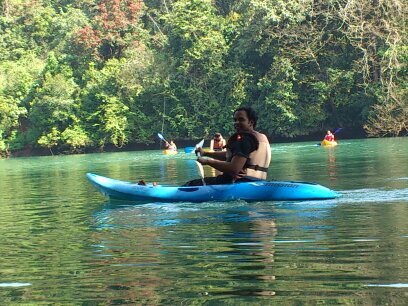 Dandeli is the only place in south india, where we can try kayaking and if you interested, you can learn kayaking completely. If you are expert in kayaking and swimming, then try kayaking in rapids. White water kayaking, is more dangerous and adventurous than white water rafting. Experience the coracle ride in kali river. It is very relaxing and don't expect the ride to be adventurous. There is another ride called crocodile ride, where they will take you for crocodiles spotting. But the crocodile ride will depends on the water level as well as the season. River crossing in dandeli is not so adventurous for the experienced, but the beginners will definitively enjoy the activity. You get to climb the steepest of cliffs and come careening down suspended by all but one rope! One wrong step could mean trouble – may be not severe, but at least a few bruises and the likes. However, there is no need to worry since your trainers take care of everything. Come into the world of rappelling on the stark rocky cliffs of the Sahyadri mountain ranges here at Dandeli. Syntheri rocks is about 50km from dandeli and a must visit place in Dandeli. It is a 300ft tall monolith of granite located deep inside the thick Dandeli Wildlife Sanctuary. With the Kaneri River gushing ferociously by its side, the Syntheri Rock is a spectacular sight. You can see hollow places on the rock which are the effects of erosion here. In the innumerable nooks and crannies thousands of pigeons have made their homes. You can also see bee hives hanging dangerously on these rocks. A thrilling jeep ride in the deep forest followed by a walk will get you to this beautiful place. Apart from the above activities, there are still many more to try in dandeli. Trekking to Supa dam, Visit Cavala caves, Natural jacuzzi bath, Jungle safari, Canoeing, Bird watching, night trekking and out door camping. River Rafting Rs 1200=00 Per Person. Kayaking Rs 350=00 Per Person. Apart from these places, there are many beautiful places in and around dandeli. You can go for half day trip to gigantic 'Dudhsagar' water falls which is around 60km from dandeli, costs around 2000 (12 seater vehicle) or half day trip to 'Sattodi Falls' which also costs you the same 2000 for 12 seater vehicle. For more information on Dandeli visit: http://www.dandeli.com/ , http://www.dandelitour.com/ , http://www.dandelimasti.com/ , http://www.dandelijunglebell.com/ . By Road: Bangalore 458 Kms Drive through Tumkur to Dharwad on NH-4 take diversion to Dandeli through Haliyal. Dandeli is well connected from other cities like Goa, Belgaum, Karwar and Dharwad, Hubli by road. Several buses ply to Dandeli everyday. You can even hire a taxi. For bookings contact 9448331729 (Imam) or 9448408844 (Anil). Nice post,I found some infromation from here,I had visited Jog Falls, It is one of the Adventure tourist places in Karnataka,The sight of this magnificent sheet of water cascading straight down a height of 830 feet unfettered by rocks or other encumbrances is one that has moved thousands of visitors,Visit Best Places In Karnataka to know more places. This is one of the first blog that I’ve seen that gives a complete picture of what to expect in Ganeshgudi. Thanks a lot. I’m heading to this place with my family for some trekking and birdwatching over the Diwali weekend. Excellent detailing on the pricing and activities. Just wanted to add a bit of info. A lot of people visit Ganeshgudi, not just for bird watching but also for river rafting Such people must know that rafting activities are highly dependent on the water release from the Supa Dam. Of course, other water activities like coracle ride, kayaking, etc., are available year round. There is also this concept of natural Jacuzzi where you get to experience the shallow gushing waters amidst rocky surface; it’s a really nice experience. Another thing, entry to wild life sanctuaries is time-bound, so be prepared for it. Dandeli, a small river side town in North West Karnataka which is famous for Wild sanctuary, Paper Mills, Syntheri Rock and Forest Resorts. You can check out places to visit in dandeli so that the next time you plan your holiday there. This is really good information you can have a look at the resort in dandeli also look at activities in Dandeli. Places to Visit in Dandeli.